Ever wonder how a large, venture-backed company grows to become a publicly listed company? We ran the numbers on tomorrow's IPO, LendingClub. LendingClub, a peer-to-peer lending platform, is slated to be the largest American tech IPO in 2014, with a valuation of $5 billion. It plans to raise $866 million through the share offering. Our infographic below shows the returns from early backers like Canaan Partners and Morgenthaler Venture Partners, who led a $15 million Series A investment back in August 2007 at $0.27 per share. That $15 million investment will be worth a staggering $884 million at IPO. Not too shabby. See below on how the other investors did. Even prior to the August 2007 Series A investment, LendingClub had raised a $2 million "Seed Round" from angel investors. They probably made an even higher return than the 5,534% that Series A investors made. Wondering why LendingClub's share price dropped from $0.27 to $0.19 between the Series A and Series B rounds? The company pro-actively registered with the SEC in 2008, a long-term business decision to bring its loans in compliance with all securities laws. Better known for early stage investments, Union Square Ventures led LendingClub's $25 million Series D round at a $268 million post-money valuation. 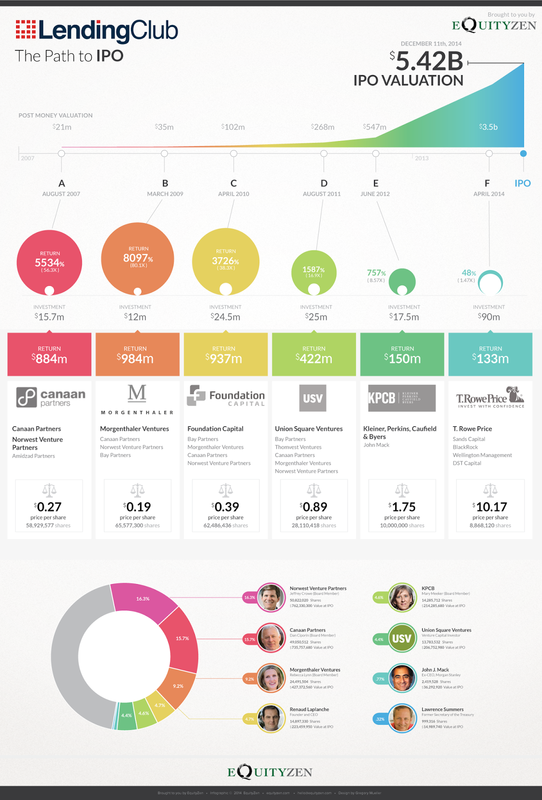 Google led a $125 million investment in LendingClub in May 2013, but you won't see them on our infographic. Rather than injecting new money, Google actually purchased shares directly from pre-existing investors and employee shareholders.